There's no "one-size-fits-all" answer for what a board should look like, in terms of size or demographics. However, there are some fundamental responsibilities that are shared by all nonprofit boards. "Board" and "board members" are not interchangeable terms. The "board" is a collective. The board is a group of people working together to govern the nonprofit and to ensure the effectiveness of the organization. The "board members" are the individuals who comprise the board. Determine the organization's mission and purpose. Not only is this key during the formative stages of a nonprofit, it is also necessary that the board review and revisit the organization's mission and purpose from time to time. As circumstances and community needs change, your mission and purpose may need to change as well. The board has the responsibility to hire, manage (see #3) and, if necessary, fire the organization's top leadership position. In the case of succession planning, the current executive (and other stakeholders) may have input; however, it is the responsibility of the board to select the executive as well as determine his/her compensation. Support and evaluate the chief executive. The board - and, indeed all board members - should recognize and acknowledge the chief executive's accomplishments. The board should also provide candid and constructive feedback. Sometimes the Executive Committee or the board chair is charged with the executive's formal evaluation; however, the full board should provide input. Boards must actively participate in organization's overall planning and goal-setting process. "Planning" is a general term and may apply to the organization's operational (day-to-day) needs, annual (operational/fundraising) needs or short- and long-term (strategic) needs. The board also has oversight responsibility and should monitor, review and adjust plans as needed. Boards are responsible for making sure that the organization has the resources it needs to fulfill its mission. That means every board member has a responsibility to help with fundraising, which doesn't necessarily mean "asking." For instance, every board member should make a personal donation every year. Board members should also help identify new donors and help thank donors when they give. The board, as an entity, has a legal and fiduciary responsibility to the organization. The board is responsible for seeing that financial controls are in place and the organization manages its resources wisely. The board is ultimately responsible for the financial decisions and related actions of the organization. Boards have a responsibility to determine proper board composition, recruit and orient new board members and provide on-going board training opportunities. Boards should have a board member job description as well as a board member commitment form so individual board members understand their responsibilities and the organization's expectations. Boards should also assess their own performance and effectiveness regularly. Your board - and your board members - are responsible for adhering to legal standards and ethical norms. Often referred to as the Three D's, all board members have a Duty of Care (acting as and reasonable person would with respect to planning and decision-making), a Duty of Loyalty (acting in the best interest of the organization, not personal self-interest) and a Duty of Obedience (not acting in a way that is inconsistent with the organization's goals). Enhance the organization's public standing. Your board - and your board members - should act as ambassadors and advocates of the organization. They should be knowledgeable about organization's programs and services. They should know and be able to tell organizational "success stories." 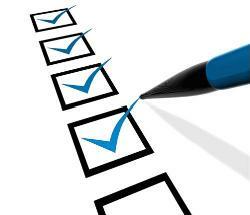 How does your board score against this checklist? Send me a message and tell me if your board is a perfect 10. And if you have some areas where your board needs work, ask how Third Sector Consulting can help. Not sure if your board is operating at peak performance? Check out these resources from Simone Joyaux, ACFRE and Charity Lawyer.